Egypt has seen a number of bomb attacks targeting civilians and tourists over the years, many of them claimed by Egyptian Islamic group Gamaa al-Islamiya. October 21, 1992: A British tourist is killed near Dairut in southern Egypt. Gamaa al-Islamiya, claims responsibility. February 26, 1993: Two tourists - a Turk and a Swede - as well as an Egyptian, are killed in a bomb blast in a central Cairo cafe. Nineteen other people, including six foreigners, are wounded. June 8, 1993: A bomb thrown into a tourist bus near the pyramids in Cairo kills two Egyptians and wounds 15 others, including two British tourists. October 26, 1993: Two Americans, a Frenchman and an Italian are killed and two other tourists injured at the Semiramis hotel in Cairo. March 4, 1994: Gamaa al-Islamiya claims an attack against a Nile cruise ship in southern Egypt in which a female German tourist is killed. August 26, 1994: A young Spanish tourist is shot dead during an attack against a minibus on the road between the Nile towns of Luxor and Sohag. September 27, 1994: Two Germans and two Egyptians are killed in the Red Sea resort of Hurghada. October 23, 1994: Gamaa al-Islamiya claims two attacks in southern Egypt in which one Briton is killed and five others, including three British tourists, are wounded. April 18, 1996: Eighteen Greek tourists are killed and 14 wounded in an attack in front of the Europa hotel near the Giza pyramids. Gamaa al-Islamiyya claims responsibility, saying the attack was aimed at Jewish tourists. September 18, 1997: Nine German holidaymakers and their Egyptian driver are killed when their bus is firebombed outside the Egyptian Museum. November 17, 1997: Sixty-two people, including 58 foreign holidaymakers, are killed in an attack in the southern city of Luxor that was claimed by Gamaa al-Islamiyya. October 7, 2004: Thirty-four people, including several Israeli tourists, are killed and more than 10 wounded in three bombings in the Sinai resorts of Taba and Nuweibeh. April 7, 2005: Two French tourists and an American are killed in a suicide attack in the Khan el-Khalili bazaar. 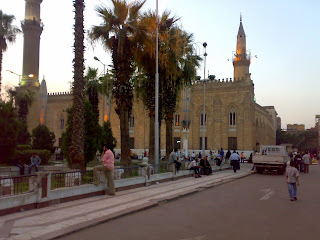 April 30, 2005: One person dies and eight are wounded in a bomb blast near the Egyptian Museum. Police kill one woman and seriously wound another after they open fire on a tourist bus. July 23, 2005: At least 88 people, including nine foreign tourists, are killed and more than 110 wounded in at least three explosions, two of them suicide car bombs, in the tourist-packed Red Sea resort of Sharm el-Sheikh. April 24, 2006: A triple suicide attack in the Red Sea resort of Dahab kills 20 people, including six foreigners. 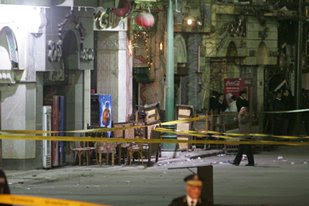 February 22, 2009: A French tourist is killed and more than 20 people, many of them European tourists, are wounded in a bomb attack in the Cairo bazaar Khan el-Khalili.